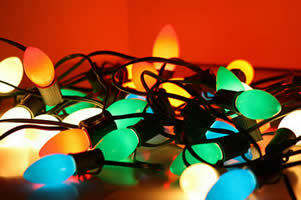 The City of Madison is accepting old holiday lights and extension cords for recycling at its drop off sites at 1501 W. Badger Rd. and 4602 Sycamore Ave.
Holiday lights and cords are colelcted with the other electronics. Remember that the use of City of Madison drop off sites is restricted to City of Madison residents and property owners only. Persons wishing to use the sites should be prepared to provide proof of residency/property ownership. We will accept any and all holiday lights and extension cords. You do not need to remove the bulbs from mini light strings or LED lights. 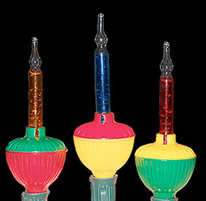 We recommend that you remove the light bulbs from older sets with larger bulbs such as those picture below. There is no limit to the number of lights and cords you can bring in for recycling and there is no fee for this program. In addition to the City of Madison locations, there are several stores in the Madison area that are recycling holiday lights. What these stores accept may be different from what we are taking at the City drop off sites so be sure to follow their guidelines.